Jakub Grosz is a Czech multimedia artist primarily concerned with light behaviour in interactive systems, video, and scanography. Issues such as complexity, chaos, and relativity of perception play a major role in his experimental works, often involving fractal structures, light, and laser set-ups as well as a wide range of transparent materials. Since 2009, Jakub has been working on European interdisciplinary projects in the LIBAT laboratory. 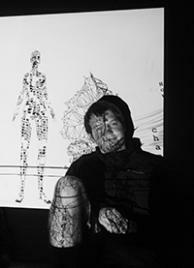 In 2011, Jakub completed the BA (Hons) Fine Art Experimental Media programme at Prague College.